Amigos Fun Run & 5K with The Weber School! Thank you City of Sandy Springs! Thank you Sandy Springs Optimist Club! Los Niños Primero & United Way Collaborative Program! LNP Chorus Performance at the Atlanta History Center! Unique Fashion Show benefitting Los Niños Primero! Dance (Cha-Cha) for the Kids! La Fiesta in the Park 2018! Reminder that we’ve got a Saturday School Session this week! 2019 Circle of Friends gala fundraising event! This past Saturday April 13th, Los Niños Primero held its annual Circle of Friends Gala Fundraising event! Such a wonderful evening full of music, performances, and a live auction! We are thankful for all of our wonderful supporters, sponsors and community members who helped us! The City of Sandy Springs recognizes Los Niños Primero in honor of Dr. Martin Luther King JR! The City of Sandy Springs’ annual tribute to Dr. Martin Luther King, Jr. took place on January 21st, 2019. This year, the celebration honored Los Niños Primero for our work with the children in Sandy Springs! Los Niños Primero is thankful for such support from our city and local community! Thank you to Mayor Rusty Paul, MC Oz Hill, Pastor Henry Bush & all those who were able to attend this celebration of service and life! An article on the event written by Reporter Newspapers can be found here! 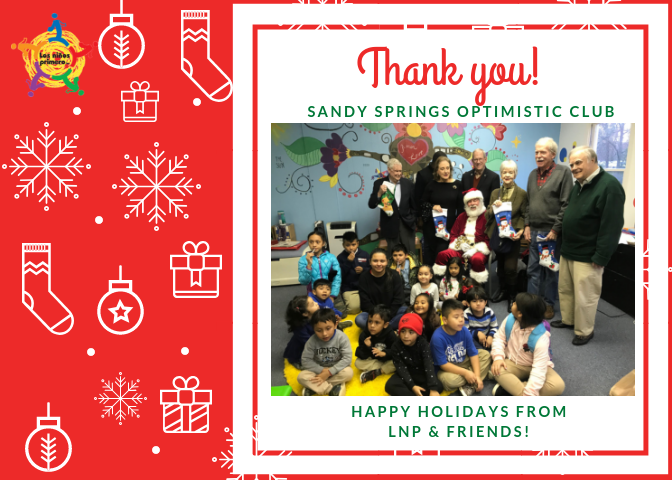 Happy Holiday’s From LNP & The Sandy Springs Optimist Club! This past week the Sandy Springs Optimist Club visited our Tuesday class of children attending our After School Literacy Program! The Optimistic Club was gracious enough to have a Mr. and Mrs. Santa Clause come visit our students to wish them a happy holiday season! Thank You! Los Niños Primero Children’s Chorus Performance! This past Sunday October 28th our Los Niños Primero Children’s Chorus, lead by Ricardo Hurtado, put on an exciting and touching performance at the Atlanta History Center! The Performance was done for the center’s Day of Dead Celebration it put on this year! Our children enjoyed not only performing for new friends, but also the various activities, information, and other performances that went on that day! Unique Fashion Show & Los Niños Primero! iMuchas Gracias!, to all who attended Talento Latino Modeling School’s Unique Fashion Show event which was able to collect funds in support of Los Niños Primero! A percentage of the nights fund was presented to LNP and will be used to allow us to continue working with our students and families! Rosa Moctezuma has been selected as the 2018 Martha Barrios Mead Scholarship recipient! Rosa was herself a student of the program from 2005 to 2006. Rosa came back as a volunteer once she was of age because she loved her experience as a student and hoped to come back to make an impact on the lives of our children just like we were able to do with her! She will be attending Georgia State University in the fall and plans to continue volunteering with Los Niños Primero! Los Niños Primero is Expanding! We are very happy to share that our annual 4 week summer program will now be offered at a total of 5 locations! LNP will now be serving students at Holy Innocents' Episcopal Church, North Springs United Methodist Church, El Nazareno Fellowship Presbyterian Church, Mimosa Elementary School, & at our main location at Mt. Vernon Presbyterian Church! Los Niños Primero was recently featured at a StoryCorps‘ event celebrating the love of community. StoryCorps is one of the largest oral history projects of its kind, collecting and archiving more than 50,000 interviews from more than 80,000 participants. Click the link above to listen to Abel's story, or click here to read more about Abel. Find out about our organization, mission, our methods, and the results of our 15 years of service. Ready to take the next step? You can become a contributor to our program, or participate yourself and join the LNP community.